The Global Africa Business Club (GABC) and the Government Network started the development of a platform which is geared towards facilitating trade and the movement of goods across Africa and the rest of the world. Providing African businesses with an infrastructure which compliments their national legal and financial frameworks which is geared towards Pan-Africa Globalisation. South-Africa, November 5th 2018, The GABC and the Government Network are working together on the creation of a platform which is aimed to reduce the barriers for African enterprises to trade without borders, cultivating a borderless mindset. The platform will be focussed around the creation of a trusted ecosystem between market actors including corporate and individual identity management solutions, access to financial instruments and transaction management. The partnership is an execution of the vision of the Chairman of the GABC, Washington Kapapiro, who believes that Africa needs to create her own tailor-made solutions if it is to ever realise its potential for economic development. The platform will be built on a decentralised framework with the individual and enterprise both central in the ecosystem. It will be equipped with the latest technological innovations and transparent by design, in line with the borderless vision on which the Government Network is created, says Jens Lievens, founder of the Government Network. The platform will complement national legal and financial frameworks where they prove to be inadequate to cultivate economic growth, allowing for a faster transitioning towards a borderless Africa, and effectively a more prosperous Africa. It is a step towards individual empowerment, reducing the impact of any businessman’s location or background. The GABC is a private business network promoting borderless thinking and pan-African globalization. A non-profit development organization founded in 2004, GABC has access to 34 African countries, 50,000 African businesses, and 26 partners’ networks to promote dialogue, debate and influence policy to improve the role of businesses and enterprises operating in Africa and globally. The Government Network is building a borderless Nation powered by Blockchain Technology, operating from a Decentralised Autonomous Organisation (DAO). Its purpose is to innovate governance and trade one step at a time through the implementation of applications serving direct market needs as drivers for the ecosystem. The NTN tokens will come into existence at the DAO launch. They are issued by the DAO’s internal exchange and operate the ecosystem’s economy, ranging from the payment of transaction fees to an operational currency for micro-transactions and e-commerce. NTN tokens are created or minted when purchased from the internal exchange, and destroyed or burned when sold to the exchange. The internal exchange holds a reserve that backs the NTN tokens. 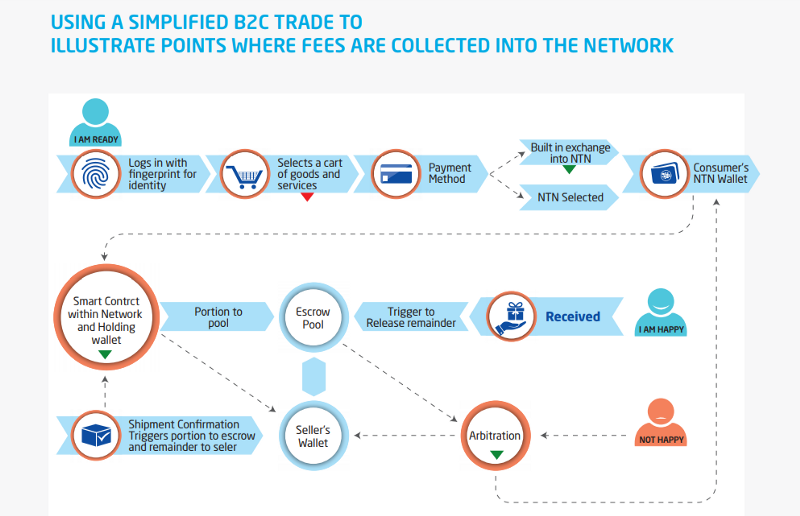 The reserve is funded by the purchase of NTN tokens, as well as part of the transaction costs received by the network. The size of the reserve is directly correlated to purchased NTN tokens and transaction fees paid to the Government Network. The reserve of the internal exchange needs to maintain a constant minimum of 85% of the value of all outstanding NTN tokens. — Ensuring constant liquidity and solvability. NTN tokens can be purchased and sold to the internal exchange freely at the fixed exchange rate of 1 NTN token per 1 $. Each time the reserve size exceeds 85% of the value the outstanding NTN tokens, the internal exchange reserve will mint new NTN tokens so that the reserve size returns to 85%. 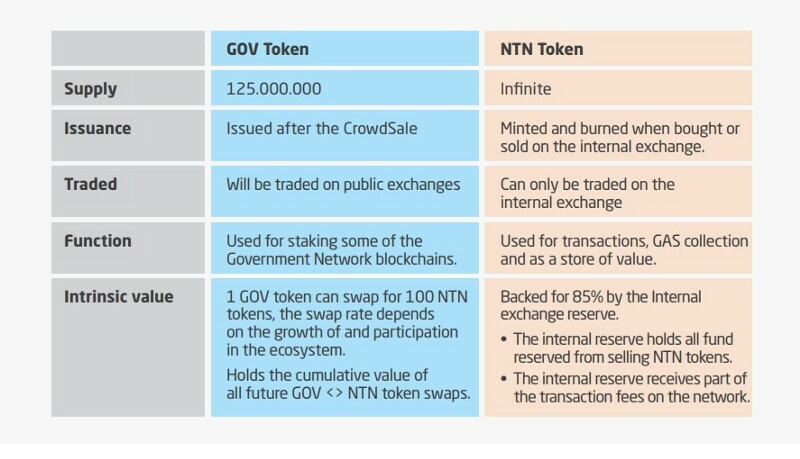 The newly minted NTN tokens are swapped equally amongst all outstanding GOV tokens* .